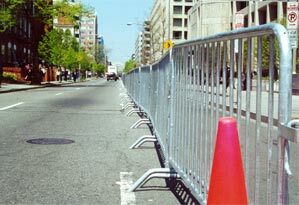 Steel barricades went up today, more police. I watched a cop on a motorcycle drive the wrong way on a one way street, stopping traffic. This week already feels long, and I have a headache that reflects nervousness and anticipation. There really are police everywhere. I live about nine blocks from where the main protest is happening, and when I went to buy bread and vegetables this morning, I counted five cops in my four block walk roundtrip. I've got to question what it is that the police learned from Seattle. I know DC cops met with Seattle police to learn about what tactics work, but what did they tell them? Is tear gas, pepper spray and rubber bullets an effective measure against peaceful protesters? Will we see the same things in Washington that we saw in Seattle? I heard that there is someone taking photos on the top of the Pepco building, I'm going to try and get pictures of them tomorrow. It occurred to me that a police radio would an amazing thing to have. I found a site that broadcasts the police radio. Later, the cops realized they were being monitored. I walked around looking at the police barricades, I drank coffee, I got a headache, I needed to write a poem for class. Fenced in by walls that took a day to put up. Now they stand there, strangely incarcerated by their own doing. Thinking Sunday's the only common ground in our collective minds. celebration--   a street parade impassioned masses upswelling of a protest. To catch the last trails of syrupy mocha-brown sugar. And cops who bring tension to the morning still. PETA members dumped four tons of manure in front of the IMF building today. When I walked by, I hadn't heard, but thinking back, I did see a lot of manure (I'm not sure why I didn't notice that initially). On the far side of Pennsylvania Ave., people are sharing large amounts of food. As one person said to a nearby NBC cameraman "Everyone is fed." I saw a steel worker talking to a kid in dreadlocks, and it reminds me how different this movement is from what I perceive the 1960's to be, where you had a lot of people believing the same things. In both cases people are fighting against a common enemy, but in this case, they have a lot of different causes. The convergence space was raided at 8 AM we were told when we got there around 2. Cops cited fire hazards and some other BS in order to get the people out. First the police allowed the puppets to be let out (it was quite a sight to see policemen carrying these large puppets), and later the food was let out, all of this loaded up into two rental trucks. Impromptu dancing and drumming settled a tense crowd, though up on 20th and K over 200 arrests were made (we didn't see this). All of the photos below link to larger versions that include captions that tell the story of my experiences on saturday, sunday and monday. A good way to see them all is through a little slideshow, which you can also get to by clicking on any of the pictures. The slideshow goes through my experiences in reasonably chronological order, but not exactly. Please go to picture #50 of a protester looking out the bus window. Included there is a detailling of the incredible abuse the arrested protesters have undergone. There are phone number to call to demand better treatment for them.